In 2012 the Swindon Robins speedway team won the British Elite League for the first time since 1967. When Sebastian Alden crossed the line in heat 12 of the second leg of the final at Poole to clinch the one point that secured the title, the championship returned to Swindon after a tortuous 45 year wait. Much has been written, quite rightly, about the successes of the Swindon riders on the track ... but speedway, like most sports, is about more than just the competitors. Behind the scenes, largely unnoticed, a group of volunteers (some certainly not young) give up their time freely throughout the year to ensure that the Swindon riders have the track and the environment they deserve. This book is about them. Throughout the 'close season' a smaller team meet up each Thursday to carry out maintenance on and around the track. During the speedway season they are augmented by the rest of the track staff. I am one of the new volunteers who joined after the glory of the title success and am trying manfully to achieve under Ronnie Russell's expert and finally tuned management skills my mythical BTEC in speedway track care. So I am in a better position than most to comment on the hard work, sweat and aching muscles that have gone into the book...and that's before writing the words. 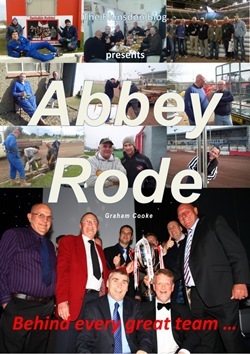 "Abbey Rode" (pun fully intended) tells the back stage story of the championship winning 2012 season at Swindon Speedway. With over A4 sized 370 pages, 125,000 words and more than 1200 black and white photographs, "Abbey Rode" provides the reader with a unique glimpse into the "hidden side of speedway." Links to the online publisher and how to buy the book in one of its many formats, can be be found at blunsdonblog.co.uk. Cost: £17.12 + PP for print copy. Copies for electronic readers (not Kindle yet) £11.99 in full colour. Graham has two other smaller speedway books available in electronic format but "Abbey Rode" is to me the culmination of all his speedway writing. Having on one occasion filled in one week in compiling his weekly blog, I can tell you that this book is an absolute labour of love which deserves to be on the bookshelves of all speedway supporters everywhere.